Beautiful oriental rugs, runners and carpets for your home. Watch this space for details of our current special offers. For great deals at any time of the year, please get in touch. Hughes Rugs specialise in supplying high-quality oriental and tribal floor coverings from the traditional carpet-weaving countries, including Iran, Turkey, Afghanistan, India, Pakistan and China. All of our rugs, runners and carpets are hand-woven, and they’re mainly produced by families in nomadic, tribal or village communities. Importing direct and keeping our overheads low means we can sell high- quality products at low prices. We’re often up to 50% cheaper than high street stores. Our fantastic home selection service means that we bring our range to you. Seeing the products in your own homes is so much easier – there’s no more manhandling heavy rugs yourself, and it takes all the guesswork out of matching to your room. Our range of rugs, runners and carpets is perfect for period or traditional home, but can also work beautifully with more modern themes. Find out more about Hughes Rugs, see where we’re holding events showcasing our range, or get in touch to arrange a home viewing. Day, evening and weekend appointments are always available. Hughes Rugs offer a specialist repair and cleaning service to restore your rug or carpet to its former glory. Our cleaning processes achieve a more thorough clean than could be achieved by home cleaning services. All of our restoration is carried out by skilled craftsmen, using professional equipment and products in their workshop. 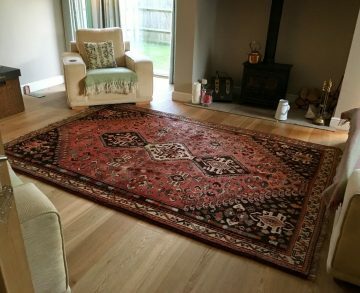 We have restored and repaired all types of rug and carpet, including kilims, runners, vintage carpets and all sorts of oriental rug (Afghan, Persian, Chinese etc). For your peace of mind, we are of course, fully insured. Stephen Hughes has provided us with several beautiful rugs over the years. He has always been charming and extremely efficient. Arriving at the house promptly and then laying out several different rigs to chose from. On several occasions he has gone to great lengths to search for a particular rug at a particular size. He even went so far as to track down an unusually long runner in Germany for us. I can't recommend him more highly. The Afghan kilims look beautiful in our house and I was very pleased to have found them at your sale. A high standard of Iranian, Afghan,Pakistani and other oriental rugs. We have always found Mr Hughes extremely helpful and pleased to produce the right answer for the situation. © 2019 Hughes Rugs. All rights reserved.